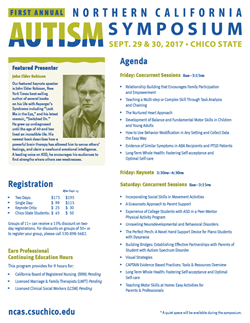 In partnership with The Yellow Door , Regional & Continuing Education at California State University, Chico will present the Inaugural Northern California Autism Symposium  on Sept. 29 and 30 on the University campus. The program will include concurrent sessions and a keynote address for professionals and parents/guardians of individuals and children diagnosed with Autism Spectrum Disorder (ASD). Session topics include family relationship building, behavior modification, whole health, incorporating social skills in movement activities, and teaching motor skills at home, among others. Hundreds of people are expected to attend this inaugural conference, which is expected to become an annual tradition. Psychologists, marriage and family therapists, social workers, school counselors, nurses, physicians, educators, behavioral health professionals, children’s advocates, and caregivers and parents throughout CSU, Chico’s North State service area are welcome to attend. Professional continuing education hours will be available. The featured keynote speaker is John Elder Robison, “New York Times” best-selling author of several books on his life with Asperger’s Syndrome, including “Look Me in the Eye” and his latest memoir, “Switched On.” Undiagnosed until the age of 40, Robison has lived an incredible life and encourages his audiences to find strengths where others see weaknesses. A leading voice on ASD, he describes in his newest book how a powerful brain therapy has allowed him to sense others’ feelings and claim a newfound emotional intelligence. Over the past 10 years, a growing number of children have been diagnosed with ASD. Current reports from the Centers for Disease Control and Prevention show that about one in 68 children has been identified on the spectrum. Though new theories about what causes ASD continue to develop, there is no scientifically proven cause or cure. According to Josie Blagrave, assistant professor in the Department of Kinesiology at CSU, Chico and program director for the CSU, Chico Autism Clinic, Northern California has seen the same increase in ASD, but because of the region’s rural location, those living and working with ASD populations in the North State are removed from the research and resource hubs of Sacramento, San Francisco and Los Angeles. “The aim of this symposium is to feature a breadth of presenters who will share their expertise on interventions, services, and supports with individuals with ASD, their families, teachers, and service providers. Oftentimes getting out to the bigger conferences is an impossible barrier—we’re hoping to eliminate that,” Blagrave said. Additional information and online registration can be found on the symposium website  or by calling Regional & Continuing Education at 530-898-6105. The Yellow Door was founded in 2010 to promote California State University, Chico student involvement and volunteer service in the local autism community. In the years since, The Yellow Door has grown to offer financial support and partnership to community events that help integrate individuals with ASD and their families in the general public and/or provide educational opportunities; foster community and leadership between local students and Autism Spectrum Disorder (ASD) stakeholders in Northern California; and provide grants to families and individuals with ASD in need of services and support.